Less a roller coaster and more a thrill machine designed for bragging rights, Kingda Ka is a one-trick pony. Granted, it's a heckuva trick and a once-in-a-lifetime rush. Bu once is probably enough. The launch might scare you silly. 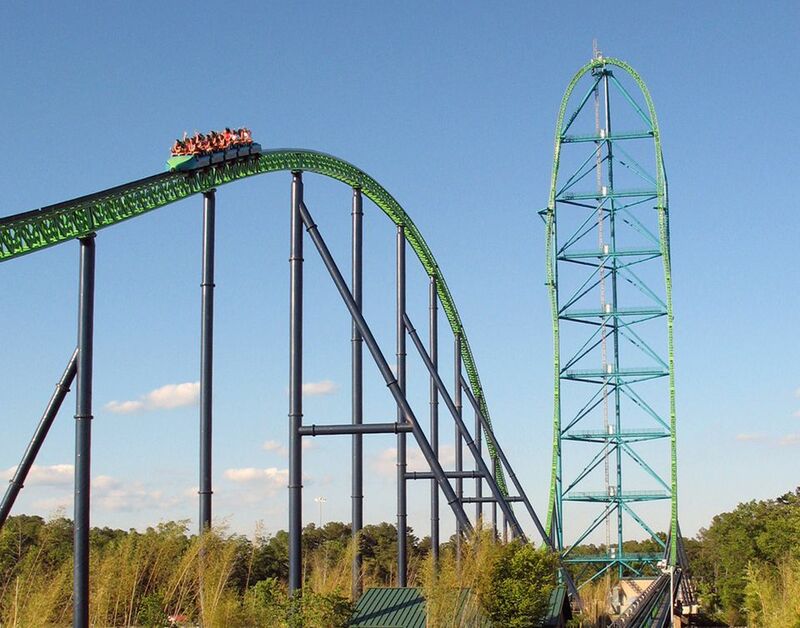 But, in the end, despite its record-breaking 456-foot tower, Kingda Ka will likely leave you feeling flat. It's hard to imagine a more thrilling ride. Insane acceleration, speed, height, and drop. 129-foot second hill designed to provide free-floating airtime. "I'm going up and down...THAT?" The anticipation is unnerving. As riders board Kingda Ka's trains in its dual-loading platforms, and the trains stack up at one end of the horizontal launch track, the ominous 456-foot top hat tower looms at the other end. The tower can be seen virtually everywhere throughout the park, and it looks incredibly tall. But staring at it head on from the vantage point of a locked and loaded train, it looks beyond nuts. You'll probably be thinking, "I'm going up and down...THAT?" Every few minutes a train takes off, adding to the pre-ride jitters. It barrels down the launch track at a brain-scrambling 128 mph, and then goes straight up the tower. As it climbs 456 feet, it decelerates and appears to barely have enough oomph to make it over the top. In rare instances Kingda Ka and other rocket coasters do, in fact, peter out and slide backwards down the tower. The rides are designed to handle the anomaly (and some fans consider it a badge of honor to experience a rollback). Kingda Ka then plummets straight down the other side and enters into a 270-degree vertical spiral. Racing back to the station, it climbs a relatively puny 129-foot hill for a spurt of airtime. No matter how many times you watch the trains cycle through the ride, nothing will prepare you for the actual ride. As with most launched coasters, the brakes release just before Kingda takes off and leave the train briefly free-floating in neutral. Then, yeeeee-ahhhhhh!, it's impelled with a staggering burst of energy down the track. Traveling 128 mph in an open vehicle is an unearthly sensation. By the way, experiencing 128 mph may feel like an unearthly sensation. But you may be wondering whether Kingda Ka is the fastest roller coaster in the world. The Six Flags ride did, in fact break records when it first opened in 2005. How does it stack up today? It’s still clinging to one record, but, there is a coaster out there that is even wackier than Kingda Ka. After zooming up the tower, the few seconds of quasi-hesitation—are we gonna make it?—is unsettling. The view at the crest of the tower, if riders can peel their eyes open, is impressive. Up to that point, and we're talking maybe 10 seconds, Kingda Ka is wild. Returning to the station, riders are a bit shell-shocked from the launch and extreme height. But they may also be a bit let down. After all that anticipation, the ride is over in a blink. Let's tip our top hats to Intamin, the ride's manufacturer, and Six Flags for having the audacity to build the record-breaking Kingda Ka. But, breaking records doesn't necessarily translate into a dazzling ride experience. Instead of the symphony of thrills—the crescendos, the releases, the peaks, the bridges—that a great roller coaster delivers, Kingda Ka is more of a sustained, single-note, heavy-metal roar. For some insight into what makes a coaster great, check out our review of Superman the Ride at Six Flags New England. Is Kingda Ka the Fastest and Tallest Roller Coaster? Are You Ready to Ride the World's Tallest Roller Coaster? What a Rush! Review of Knott's Berry Farm's Xcelerator. Could You Handle One of the World's Fastest Roller Coasters?